A dense hard wood most commonly used for decking and flooring. Its color varies from reddish brown to blackish brown. Ipe is mainly used for decking and flooring, but can also be used for furniture and turned objects. Ipe wood is a good long-term investment. It is very resistant to decay, fungus, termites, and fire. It is suitable for different climates, can withstand harsh weather conditions, and can last up to 25 years. 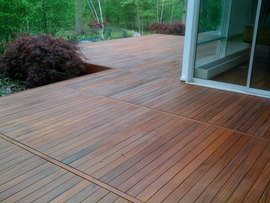 Ipe decking costs about $20 to $30 per sq. ft.